A party’s the perfect way to drag a dragon out of the dumps. In the dirt-covered trash dump of Smelliville live the Ogglies, friendly green folk with big lumpy noses and a love of mud and muck. They work hard all day on various gadgets and necessary chores. The Oggly twins want to go on an outing with their pet dragon, Firebottom, but notice that he’s just lying listlessly in his wooden house. Various remedies are tried—a good rubdown with brown ooze, a pair of stinky socks—but none succeeds. 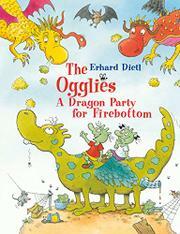 One of the Oggly twins says that Firebottom needs some friends. That seems like a good idea to all, so they decide to throw a birthday party (even though it’s not his birthday). Dragon guests start flying in, brought by Batty, a red-nosed bat with a slightly daffy expression. There’s Rocky Red, who has golden spikes all down his back, and Blinky Blue, with a polka-dot, segmented body. Leah Fang, a Chinese dragon with a snake on her head, delights Firebottom with a hot kiss on the nose. Games, freaky food, and a flying competition make for an exciting day and lift Firebottom’s spirits. Dietl’s quirky imagination seems to know no bounds, in both text and pictures; there’s even a birthday song on the last page. The lengthy text is printed in relatively small type, but the ebullience of the story should keep elementary-age listeners’ attention.